Meet the new flagship of the COOLPIX Advanced Performance collection, the COOLPIX A, a one-of-a-kind Nikon camera that produces high-resolution photos and Full HD 1080p videos in a class of their own. The COOLPIX A is exceptional in every aspect. 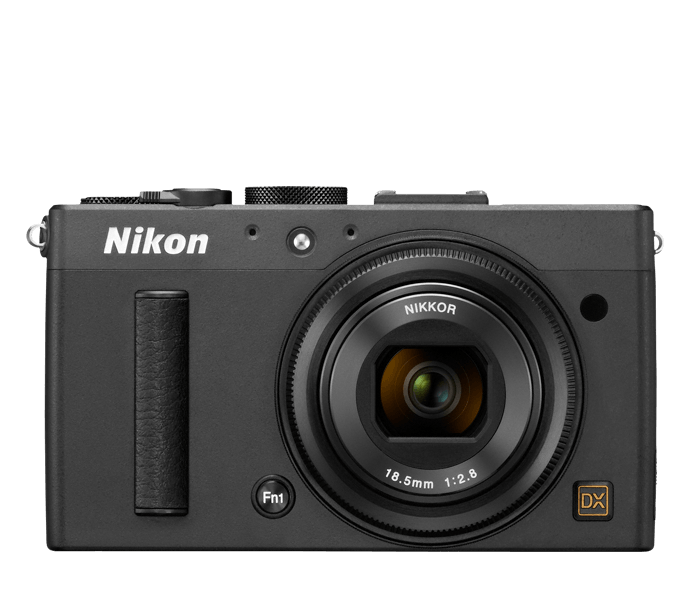 For exceptional image quality, it employs a Nikon DX-format CMOS sensor, the same type used in our outstanding DX-format D-SLR cameras, but in a compact body. For exceptional clarity and low-light performance, it features one of the most impressive NIKKOR lenses we've ever put on a COOLPIX camera. For exceptional versatility, it's compatible with many Nikon accessories like a Wi-Fi adapter that lets you instantly share your photos. Simply put, the COOLPIX A produces the kind of photos and videos that will leave your dazzled friends and family asking, "What kind of camera do you have?" At the heart of the COOLPIX A is a high-performance Nikon DX-format CMOS image sensor, the same size sensor used in Nikon DX-format D-SLRs! Achieve the ultimate COOLPIX image quality—breathtaking crystal-clear photos and Full HD videos with vibrant colors and rich textures—and shoot without a flash in some of the most poorly lit situations. The COOLPIX A includes a full-size accessory shoe that’s compatible with many exciting Nikon accessories. Frame your pictures up close by adding an optical viewfinder. Minimize flare caused by direct sunlight and get clearer photos with better contrast using a Lens Hood. An array of accessories helps you do that, plus take control of light, fire the camera remotely, geotag your shots and more! Add accessories to easily customize your camera system and cater to your unique needs. Connect the optional WU-1a Wireless Mobile Adapter and wirelessly transfer photos to your compatible smartphone, tablet or any Wi-Fi enabled device±. Use your compatible smartphone or tablet to instantly upload your shots to the web or email them to a friend. Or, remotely control the COOLPIX A—see what the camera sees from your smartphone or tablet and fire off shots! If you want a compact camera that shoots stunning Full HD videos, the COOLPIX—delivers. 1080p Full HD means exceptional video quality. Record the action, then use an optional HDMI cable to connect to an HDTV and watch your videos come alive. A built-in mic records high-quality audio in stereo. Your videos will look and sound phenomenal. The COOLPIX A takes exceptional images on its own, but when you want to take control, you can. Select from Programmed, Shutter Priority, Aperture Priority or Manual mode and bring your vision to life. For those who want to record the purest, unmodified versions of their photos, the COOLPIX A can record in RAW (NEF) mode. The COOLPIX A's highly sensitive CMOS image sensor performs so well in low-light situations that in most cases, using the flash is optional. Capture the moment without interrupting it. The COOLPIX A features a truly superb lens, a fixed (prime) 28mm** f/2.8 NIKKOR glass lens. Create tack-sharp wide-angle images with beautifully blurred backgrounds, and enjoy enhanced low-light performance compared to a typical zoom lens. *Based on the Camera and Imaging Products Association (CIPA) standards for measuring the endurance of camera batteries. Performance for still pictures measured under the following test conditions: image quality set to JPEG normal, image size set to #Large (4928 × 3264), and flash fired with every other shot. Movie recording time assumes movie settings of o1920 × 1080; 30p or p1920 × 1080; 25p. Performance varies with the condition of the battery, temperature, the interval between shots, and the length of time menus are displayed.